Trinamic's TMCM-110-42, is a 1-axis intelligent stepper motor controller and driver module, that is directly mountable on a 42mm flange motor. 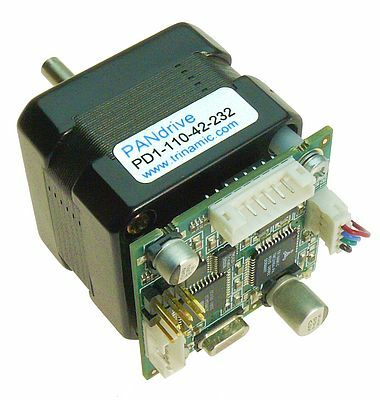 The module converts the motor into a compact mechatronic device with bus oriented or stand-alone control. The motor, switches, power and the multipurpose I/O’s can be connected with small plug in connectors. It comes with the PC based software development environment TMCL-IDE for the Trinamic Motion Control Language and uses predefined TMCL high level commands, guaranteeing an easy and fast development of motion control applications. There are two inputs for reference, stop switches and one general purpose digital or analogue input and one output. The stallGuard option detects motor overload or motor stall without the need for an encoder or sensors. TRINAMIC Motion Control develops and provides integrated circuits, modules and systems for cost sensitive embedded motion control applications, particularly stepper and BLDC motors as well as piezoelectric actuators.